Enhanced E Versions - Now Available! Due to a shortage of material the Soft Case will be back ordered and shipped at a later date. 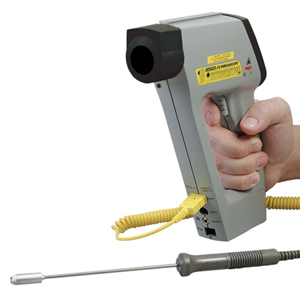 With a combination of powerful features, the portable and rugged OS530E series infrared thermometers offer solutions for many non-contact temperature measurement applications. Emissivity adjustable from 1.00 to 0.10 in 0.01 increments, the OS530E series provides versatility when measuring a variety of surfaces. A custom backlit LCD display provides dual digital display of both current and max, min, diff or average temperatures simultaneously. This provides the user with more information at a glance. Built-in laser sighting creates a 12-point circle which clearly indicates the target area being measured. The OS530E Series also features a high alarm setpoint, providing both audible and visual indication of the alarm status. The standard 1 mV per degree analog output allows interfacing with data acquisition equipment, including chart recorders, data loggers and computers. All Models Feature: Adjustable Emissivity, Backlit Dual Display, Differential Temperature, Min/Max Temperature, Average Temperature, High Alarm, Audible Buzzer & Indicator, Analog Output (1mV/Deg), Laser Sight (Built-In), Trigger Lock, Last Temperature Recall. OS532E Adds Thermocouple Input, OS533E Adds Low Alarm, Ambient Target Temperature Compensation, RS-232 Output, Thermocouple Input. OS534E Adds all of the OS533E Features plus Data Storage. * or 1.7°C (3°F), whichever is greater. Model OS530HRE has 0.1° display resolution.